Kane Is Able has had great success in reducing the number of workplace injuries and other incidents in the last 13 years, achieving a reduction of 56% in the Recordable Incident Rate (RIR) during that time. We’re not perfect, and there’s always room for improvement. But we feel we’re getting something right when it comes to logistics safety, and we’d like to share some of our tactics, strategies and findings from our journey, as well as observations gained from the wider logistics industry. The warehousing and storage industry alone experiences nearly 15,000 injuries and illnesses each year, according to the U.S. Bureau of Labor Statistics. Trucking is fraught with danger, too. The U.S. Occupational Safety and Health Administration (OSHA) estimates that roughly 475,000 large trucks with a gross vehicle weight rating of more than 10,000 pounds are involved in crashes each year, which result in approximately 5,360 fatalities and 142,000 injuries. Often, it’s not the truck driver’s fault. It is estimated that the unsafe actions of automobile drivers are a contributing factor in about 70 percent of the fatal crashes involving trucks. These accidents carry a hefty price tag both personally and for the company in terms of insurance costs, lost time, productivity dips and other negative consequences of injuries. Here at KANE, we reckon there are four initiatives that can make the most difference in moving your RIR down and reaping the health and economic rewards of doing so. Establishing a culture of safety starts at the top. At Kane Is Able, safety is, if anything, over-communicated. Literally every time our CEO, Mike Gardner, speaks, safety is the first thing he mentions. It’s absolutely crucial that C-level executives make it clear that safety is a top priority. Otherwise, all the posters, training and speeches will come across as so much service. The commitment must be real and go from the top down. Part of establishing a positive safety culture is to look for opportunities to celebrate accomplishments. For instance, get workers excited about hitting records for incident-free days. Earlier this year, KANE achieved 90 days without a single incident throughout all our nationwide logistics operations, and we saw it as an opportunity to build positive energy. As we got close to that record, the safety group announced each benchmark as it passed. We made it very public when we passed 37 days, which was our previous high water mark. We said: “Let’s do 38, let’s do 40!” Then, we announced that if we got to 90 days – as an organization – the whole company would be rewarded with celebratory lunches at all the DCs. So we got there, and it felt great. Look for similar opportunities to spotlight accomplishments at your company. Remind associates they are part of something important. We celebrate successes as they happen, but we also keep the big picture in mind and share those results as well. Here’s a chart showing our 13-year record at KANE of driving down safety incidents 56%. Don’t allow associates to be in “listen mode” only when it comes to communications on safety. They must be a vital part of the process. During the lead up to our 90-day achievement, we went to all KANE facilities and had staff members talk about what specific things they were doing, individually, to improve safety. We held a group meeting every day where the facility would shut down for 30 minutes so that people could share what was working for them. There is a safety ambassador at each of these meetings, so we’re documenting these best practices and sharing relevant information across our facilities. A safety audit should not be a white-knuckle ordeal. If you do safety audits for your company, know that associates may view you as being in “gottcha” mode – almost like when the health inspector visits a local restaurant. It’s critical that you turn that perception around. Make sure the local warehouse or terminal manager views the audit as a collaborative exercise aimed at achieving mutually desired goals. 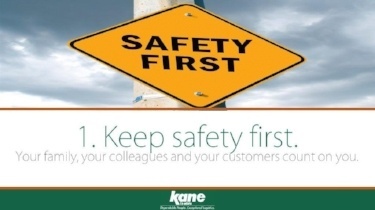 At KANE, facility managers are actually evaluated, in part, based on the safety scores of their operations. If similar criteria exist at your company, you can play a key role in helping the manager improve his or her own performance record. In order to reassure your colleagues that you’re not there to throw them under the bus, spend time building personal relationships. Make sure that managers and other associates don’t see you ONLY during audit time doing audit-type work. Talk to associates. Listen to their concerns. Attend safety meetings and celebrations. Invest time to show how personally invested you are in the facility’s success. For local associates to embrace the role of corporate safety managers, they must get beyond the perception that auditors are just ticking boxes on an OSHA safety checklist. During a safety audit, we recommend having a team physically walking the building alongside management, proactively looking for opportunities to increase safety. At KANE, it will typically take us a full hour to do a walk-through, depending on the size of the facility. We regard it as an active period of discovery that’s just the beginning of a safety assessment. It’s not a heads-down process of auditors checking off boxes. It’s a collaborative and interactive process. Associates will recognize this and begin to understand that you genuinely care about making things better. The type of logistics activity can be quite different across different operations, so don’t take a uniform audit approach. The safety issues at a retail cross dock are different from those where rail boxcars are being unloaded all day long. For each site, establish four or five factors that are most relevant and can be measured. This really helps drill down to the level where positive results start to happen. Once you start getting deeper, the audit gets a lot more specific to each operation. Audits do include some generic elements across facilities, but it’s the more detailed, facility-specific elements that offer the best potential to improve best practices and raise safety standards. There’s a whole universe of accident causes, but certain underlying reasons are clearly identifiable. Many accidents come in the form of slips, trips and falls, as well as injuries sustained while lifting. Often, they happen when people are hurrying and skirting basic safety procedures. Associates need to be trained rigorously to be more conscious of predictable hazards. OSHA recently released a report on common causes of accidents in warehouses. The list below is their top 10 areas for which they issue citations. In every area, you’d be wise to have a training module that addresses the dangers associated with each, and ways to minimize these accidents. The biggest training challenge we’ve found is not developing training on specific safety procedures, but on overcoming the complacency that develops among associates. At the recent CSCMP annual conference, astronaut Scott Kelly gave a presentation about his experience flying the space shuttle. He talked about the powerful temptation to assume that nothing is going to go wrong. The space shuttle is such a sophisticated and well-built piece of machinery, it’s easy to feel complacent, since just about everything is automated. The same applies to so many pieces of equipment we use every day in logistics operations. Trucks, automated conveyors, and lift trucks can be quite sophisticated, but a split-second loss of focus by an operator can turn them into very dangerous pieces of equipment. To drive down your RIR, make safety a highly visible element of everyday operations. At KANE, we clearly display our current days without incident metric, as well as other safety and compliance measures. Associates take pride in having good performance, and take ownership of these numbers. This transparency and accountability creates healthy competition between facilities. Our associates want the full team to succeed but, like most of us, they want to win. So we encourage friendly competition among KANE facilities. At that same time, we’re careful to make distinctions between facilities for the sake of fairness. Some logistics operations are almost completely automated, while others are more manual and, therefore, more likely locations for safety accidents because there is more human activity. Competition is healthy; it just needs to be fair. Keep in mind that management must also be accountable when it comes to safety. One way to demonstrate a commitment to safety is by investing in better equipment. For instance, KANE recently invested in upgraded lighting, security access controls, and camera systems to keep our buildings updated. Associates notice these types of investments, and recognize that management is reinvesting the company’s profits to give associates the kind of work environment that keeps everyone safe. A good logistics safety program goes way beyond a set of policies and procedures and a training schedule. The secret sauce is to develop a pervasive, operations-wide culture that understands that safety is simply smart business, and that it applies to absolutely everyone. That kind of culture doesn’t get established in a couple of months. It takes years to get a mature culture of safety in place. A strong, proactive and safety-minded CEO can help shorten this timeline by constantly reinforcing the importance of safety and the role of each individual associate. Ultimately, safe logistics operations don’t happen because of a few hard-working safety managers. Meaningful progress happens only when associates, across the organization, embrace safety as a personal responsibility.